as distributed at the Washington State Fair and elsewhere. Individual life memberships are currently $200 regardless of how the newsletter is received. Use the PNNA membership application to join. The application is good for new memberships and renewals, and also has an online payment option (see below). 3-year dues options are available for individuals and families! See the info at the bottom of this page or on the PNNA membership application. The PNNA accepts PayPal online payments – use the convenient buttons on the membership application to pay online, or log onto PayPal, and send your payment to sales@pnna.org! 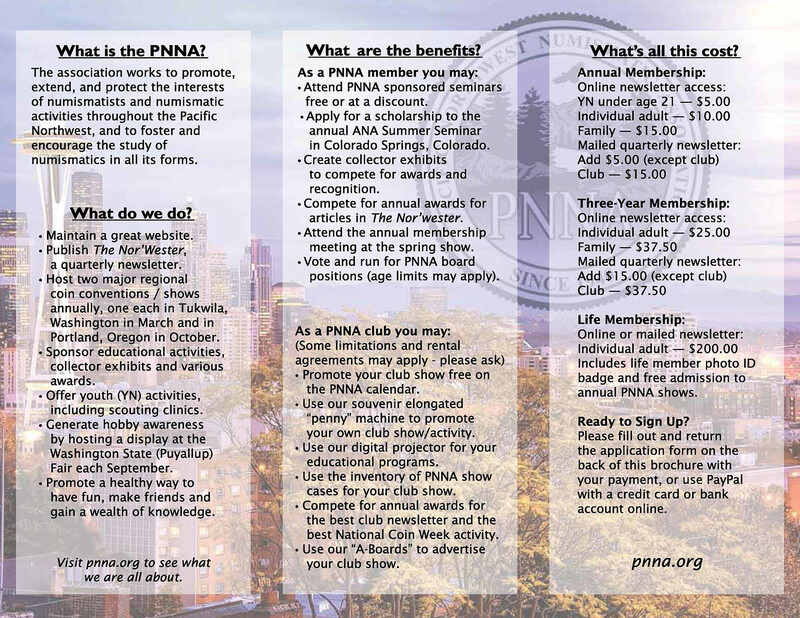 Why Should I Join the PNNA? Maintains this web site and publishes a quarterly newsletter (The Nor'wester) with news of numismatic events in the region, including a show/event calendar (your club's show is listed free of charge if you send us the details). Hosts two annual conventions, one in the Puget Sound area and one in Portland, Oregon (in cooperation with the Willamette Coin Club). Sponsors a table promoting numismatics at the Washington State (Puyallup) Fair every fall — staffed 12 hours daily for all days that the Fair is open to the public. Provides two $1,000 scholarships (one adult and one YN) to attend the ANA Summer Seminar in Colorado Springs. See the scholarship page for more information. Sponsors ANA National Coin Week club awards. Promotes competitive exhibiting at its own convention and at shows of member clubs. Provides $200 for the annual convention best-of-show exhibit winner to take the exhibit to the ANA convention in the same year. Provides an award of about $200 for the person best promoting numismatics in the Pacific Northwest each year (the Bob Everett Memorial Award). Provides speakers for club meetings upon request. (1990 Seattle, 1998 Portland, 2009 Portland, 2015 Portland). Has distributed numismatic promotional materials to libraries and schools throughout the region. Please see the membership brochure for more details including club benefits. What else would you like the PNNA to do for you? Join, become a participant, and let us know. Please add $5.00 per year for paper newsletter copies (except club and life memberships). Young Numismatist (up to age 21) — $5.00 for one year. Individual — $10.00 for one year; $25.00 for 3 years. Family — $15.00 for one year; $37.50 for 3 years. Club — $15.00 for one year; may pay for up to 10 years at a time. Life — $200 (individuals only). Dues, along with the membership application, should be mailed to Eric Holcomb or Scott Loos at the address listed on the application, or use PayPal. 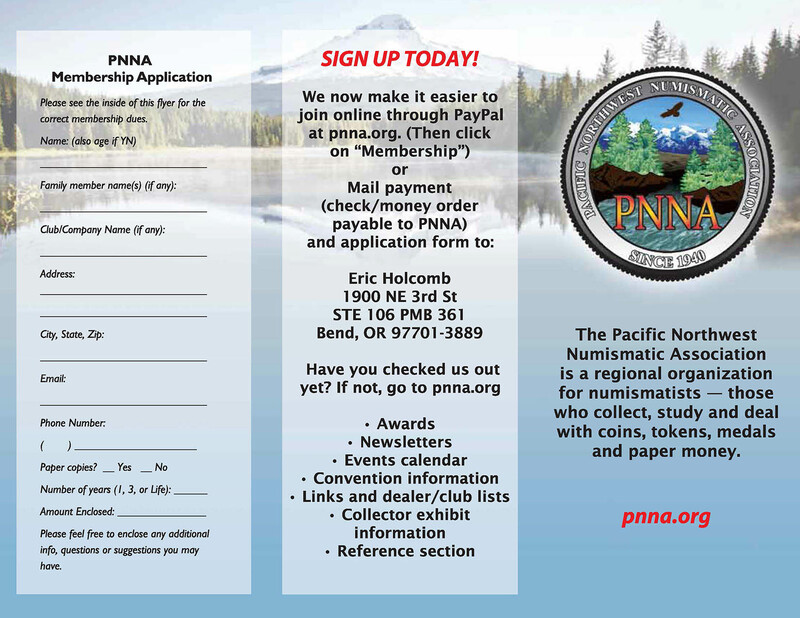 Thank you for supporting numismatics in the Pacific Northwest! 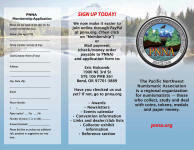 Get the PNNA Membership Application (new or renewal).